Analyzing Trends: How Investors Will Profit from Millennials & Baby-Boomers? You are here: Home / Learning Center / Analyzing Trends: Why Investors Will Profit from Millennials & Baby-Boomers? Experts predict that millennial and baby boomer generations will influence the real estate market. In this article you’ll see why. Learn how to analyze population growth statistics to predict investment opportunities. Job growth, population growth and affordability are the 3 most important factors when choosing a strong real estate market. I call it the Real Estate Market Triad. And since these factors are always shifting, it’s vital that we pay close attention to those changes. In today’s article, I’d like to dive deeper into the population growth statistics and what it can teach us. After all, big money is made when we use today’s data to help predict tomorrow’s developments. We know the U.S. population is growing by 4.5 million people every year, but who are these people? How old are they and what are they doing? Where are they living? What are they buying? Demographic trends are truly what drive economic growth. Therefore, we must become experts at understanding the makeup of today’s Americans. Until now, the Baby Boomers have been the largest generation in the United States for over 5 decades, and their spending trends have been driving the economy. However, their population is now shrinking as they age – they are 51-69 years old today. Boomers reached their population peak in 1999 at 78 million due to immigration, but declined to 74 million in 2015. Due to mortality, this generation is expected to dwindle to just 16 million over the next 3 decades. How will Baby Boomers influence the economy in the coming years? Baby Boomers were expected to retire and move to the Sunbelt to enjoy their Golden Years. But unfortunately, many were crushed financially by the stock market crash of 2008, along with their declining home values. This has forced them to keep working longer than they expected to make up for the losses. This means most will stay in their homes, near their jobs. Many Baby Boomers who who have been lucky enough to retire (estimated 10,000/day!) have still opted to stay in their homes rather than downsize. That’s partly because their children (the Millennials) have had a hard time moving out. The job market has been tough on college grads since the Great Recession wiped out so much job growth. In fact, nearly 1/3rd of the Boomer’s adult children are still living at home! Baby boomers must really like having their kids around, because surveys show that even when the kids have managed to move out, their parents want to have a place for them to come home to visit. Many are not downsizing, but instead, keeping the original family home. Great wealth was amassed by following the Baby Boomer generation’s buying trends. If you wonder why funds in the stock market grew so large over the past few decades, it’s because this massive generation was in their savings years. 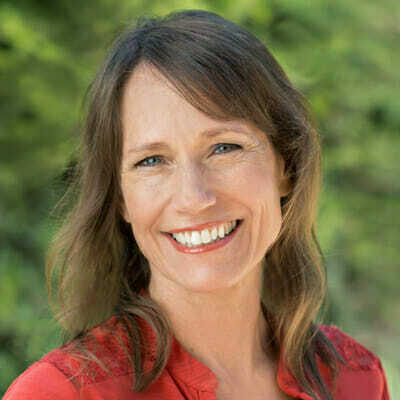 What do you think will happen to the stock market now that the Boomers will be withdrawing their savings? Will subsequent generations be adding to it as quickly? Health care industries will also boom over the next 2 decades, along with leisure activities and tourism (retirees tend to be the most prolific travelers). 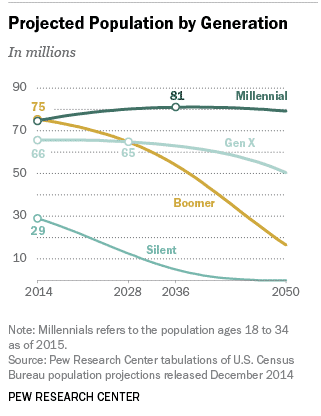 While we still want to pay attention to the Boomer’s buying habits, we also know their population is declining while the Millennial population is growing. These young adults will be working, renting and then eventually starting families and buying homes. 75.3 Million Millennials and Growing! While Baby Boomers carried a lot of financial weight as the largest U.S. generation, their children have just this year surpassed them in size! The Millennials (ages 18-34) now represent the highest population in America, with ages 22-24 being the largest group. There’s been a lot of hype in the media projecting that this massive generation will fuel housing growth. That may be true, but it’s not unfolding quite as housing economists predicted. As I said, the Millennials had a tough time finding employment during the Great Recession, especially since their parents were forced to keep their jobs rather than retire and free up space for new employees. In fact, young adults faced the highest unemployment rates of all workers over the past few years. But things are changing now that the economy is improving. Just this year, the Millennial unemployment rate approached that of the general population, meaning more of them have finally found work. 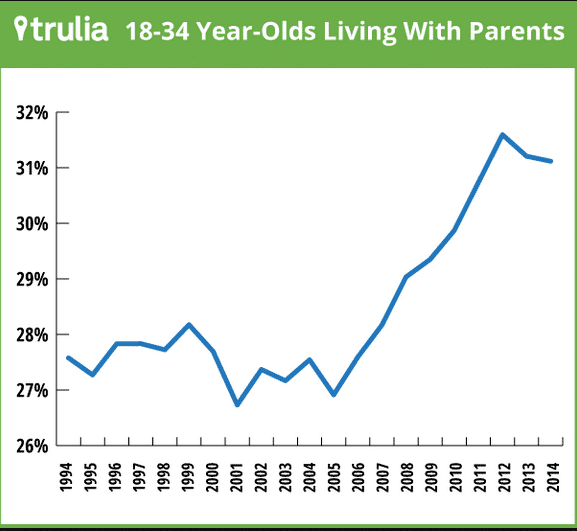 As Millennials start making money, they can finally move out from under Mom and Dad’s roof. This is why they are expected to drive TWO-THIRDS of all household formations over the next 5 years! However, they aren’t necessarily looking to buy their first homes as desperate economists have suggested. Instead, they will likely start out as renters since they don’t have a 2 year job history or savings, and are saddled with over $1 Trillion in student loan debt. Fortunately, the cost of that education seems to be paying off. Millennials have been described as the most educated and tech-savvy generation in history. And that student loan debt is not as bad as it sounds. Even though together as a generation, they’ve accumulated massive student loan debt, in reality, 70% owe less than $25,000. How will the Millennials affect the housing market? At some point, these twenty-somethings will want to settle down and have a family, albeit much later than prior generations. And since the bulk of Millennials are between the ages of 22 and 24, I think we can safely estimate that 6-10 years from now, they will be ready to purchase a starter home. And 10 years from now, their Baby Boomer parents will be between the ages of 61-79, and appear to show trends of wanting to move near their grandchildren – further adding to demand. 40 million households x June’s national median home price of $236,400 = $9.4 TRILLION! Existing home sales hit 5.4M in June, 2015 (5.79M in Feb 2006). At this rate, it would take 8 years to satisfy Millennial demand. Where will the Millennials be buying property? Millennials are moving to cities that are affordable, offer plenty of jobs in high-tech, and have a thriving downtown lifestyle. They want to live near their jobs, and be close to chic restaurants, nightlife, and cultural activities. As for their living environment, Millennials want eco-friendly, energy efficient homes with lots of outlets and fast internet. They won’t need dining rooms per se, but do want home offices. They tend to work long hours so most prefer move-in ready, low maintenance homes. According to the National Association of Home Builders, 2/3rds of Millennials will want to eventually live in the suburbs near good schools. They will want affordable, sensible mortgage payments as they do not want to be maxed out like their parents were during the credit bubble. Gen Xers are Back too! Millennials will not be the only generation buying property. While historically Gen Xers (ages 35-50) have been a smaller generation, they will surpass the size of Baby Boomers by 2028! In fact, due to immigration, the Census Bureau projects that the Gen X population will peak at 65.8 million by 2018. This group that was hit hardest by the foreclosure crisis, but they are now getting back on their feet, cleaning up their credit, and rebuilding their savings accounts. While many have been renting, they will likely be ready and anxious to buy a primary residence as part of their retirement planning. With a 30-year fixed rate mortgage (they’ve learned the value of paying down a mortgage! ), they could have the home paid off by the time they are between 65-80. How can you profit from these demographic shifts? We know a tidal wave of real estate activity is on it’s way, and in fact has already begun. It’s presenting itself now in the form of rental demand, forcing rents up. With more demand than supply, builders are frantically trying to put up apartments in every major metro. BEWARE! Before rushing out to buy cool condos downtown or much-coveted apartment buildings…. You must note that this crazed demand for rentals will turn to single family homes in 6-10 years (or earlier), and this demand could last for over 20 years! In fact, even demand for single family home rentals has outpaced demand for apartments. While urban condos and apartments could have an upside, they are expensive and don’t cash flow as well as some inexpensive single family homes in the suburbs. If you do take the risk of investing in apartments or condos, you need to be able to sell them before the masses turn to suburban home-ownership. As you can see, we believe the best bet for investment is buying single family rental homes in the suburbs of growing metros, and enjoying excellent cash flow today. As prices in city centers increase, more and more people will choose to rent in the suburbs, and rents will continue to climb. And at that time, YOU and I will own the assets that everybody wants, and we can name our price. ? If you would like a list of metros attracting Millennials, Baby Boomers and Gen Xers today, sign up here.